Just over a month prior to the return of Pretty Little Liars, ABC Family has come out with some serious scoop regarding the season three premiere. Titled "It Happened That Night," the episode will pick up a few months after events - MAJOR events! - on the season two finale, as the gals prepare for the second anniversary of Alison's disappearance. A summer has passed since Aria, Emily, Hanna and Spencer found out about Mona being ‘A’ and Maya’s death…. Each of the four girls spent their summer in different ways – Aria taking a photography class, Spencer taking college courses at Hollis, Hanna taking cooking classes with Caleb and Emily building houses in Haiti. But… with post-traumatic stress, anger and the acquisition of more secrets the four Liars are anything but fine. 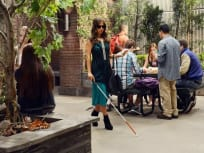 Now all back together and coming upon the second anniversary of Alison’s disappearance, the girls find themselves back on the defensive when a shocking event rocks Rosewood. For more on what's ahead, look back at this interview with Pretty Little Liars creator Marlene King. If I never see another shovel again it'll be too soon. Permalink: If I never see another shovel again it'll be too soon. Emily: You got an internship at Vera Wang? Hanna: Yeah but I changed my mind, it turns out they want you to work for free. Pretty Little Liars Round Table: "It Happened That Night"
Pretty Little Liars Season 3 Clips: Can You Say Hello?